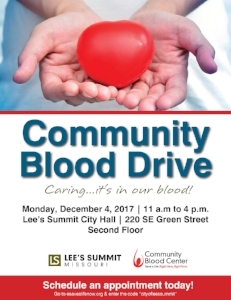 The City of Lee’s Summit, in partnership with the Community Blood Center, will host a community blood drive on Monday, December 4 from 11 a.m. to 4 p.m. in the Howard Conference Room (second floor) of Lee’s Summit City Hall, 220 SE Green Street. Click here for more information, and enter the code “cityleessummit” to sign-up for the “Caring…It’s in our Blood” event. This is the community’s opportunity to collect blood to supply local hospitals, including those in Lee’s Summit, to help save lives. The City’s goal is to collect 40 units of blood during the event. Thanks to our great community, we were able to surpass our goal during the last community blood drive in October by nearly ten units. That’s enough units to save or impact up to 100 lives. The requirements to donate blood are few. Donors must be in good health, weigh a minimum of 115 pounds and be at least 17 years of age (16 yrs. with parental consent). It is also important to drink plenty of fluids and eat a good meal prior to a blood donation, which will take less than an hour. While walk-ups are permitted on the day of the blood drive, it is preferred that donors sign-up in advance. Doing so will prevent waiting long periods of time to donate blood. Stephanie Walters has worked for the City of Lee's Summit for nearly 30 years, but has made a name for herself during the past 20 years as the volunteer coordinator for the City's community blood drives.